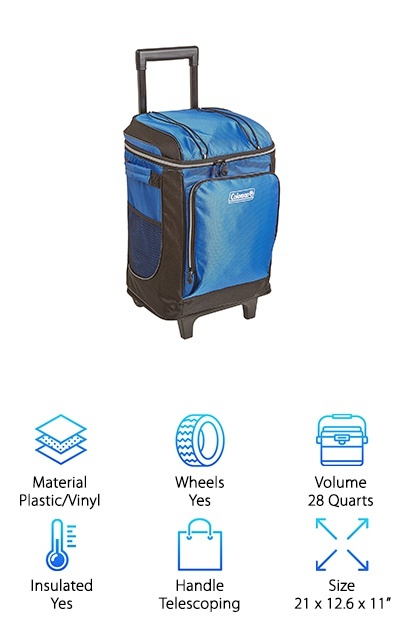 The best wheeled cooler for beach use is easy to maneuver and stores your valuables without giving you any problems. It holds toys, food, and drinks and helps you have a fantastic day at the shore with friends and family. We researched a variety of new and bestselling products to help you find the best beach coolers. The result is the top ten beach cooler reviews below. Now: Before we get started, here’s what you need to know as you shop. Material: We selected our favorite top ten coolers in a wide range of fabrics, including canvas cloth, plastic, poly, and vinyl. Check the chart for every selection to see which fabric was used to create the cooler you like best. Wheels: Do you need your beach cooler to roll along with you as you head down to the water? Some of our reviewer’s favorite choices do have wheels attached. With a simple yes or no, we’ve noted where wheels are included. Volume: Can you place a cut-up watermelon in your beach cooler? How about several large bottles of water? You probably have a list of the things that need to fit inside these coolers, so we have the volume listed for each. Insulated: Some people love nothing more than to barbecue at the beach or have a picnic. Your needs may require a bag that is insulated to keep cold foods cool and hot foods warm. No need to check – we marked it for you! Handle: Each of our bags comes with its own carrying method. One of our top categories is the type of handle included. Is it a strap? Can you place it on your shoulder, or does the cooler need to be pulled? Size: Finally, we note the full dimensions of each of our best cooler for beach selections. Height, width, and length are included. You can compare and contrast easily amongst our top ten as you shop. Do you prefer something larger, or smaller? Now that you know what you’re looking for as you hunt for the best cooler for the beach, let’s get right to the reviews. Here’s the deal: If you’re in a hurry, take a look at our top pick and our budget pick. Both are fantastic products, and the best beach coolers we found. Right below, you’ll find all runner-ups in our cooler reviews. 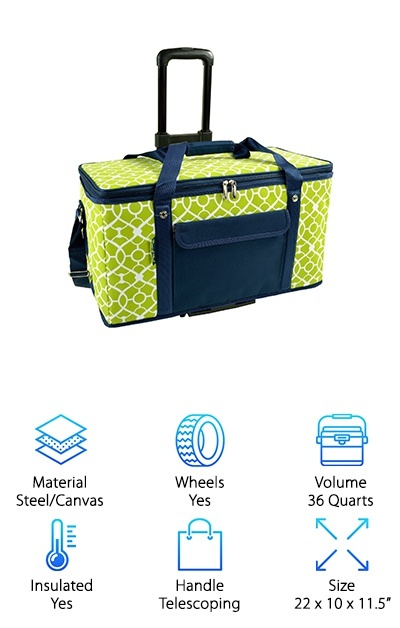 If you’re looking for the best rolling cooler for beach use or even a non-roller, they’re here! Our top pick is black and white and fun all over. The Coleman Xtreme 5 Wheeled Cooler is the best option around for fun at the seashore or the lakeshore. Why? Let’s check out the details. This is a very sturdy piece of plastic construction, with all of the bells and whistles you’re looking for. It is a large cooler with 50 quarts of capacity, which comes out to about 84 cans of soda or beer. 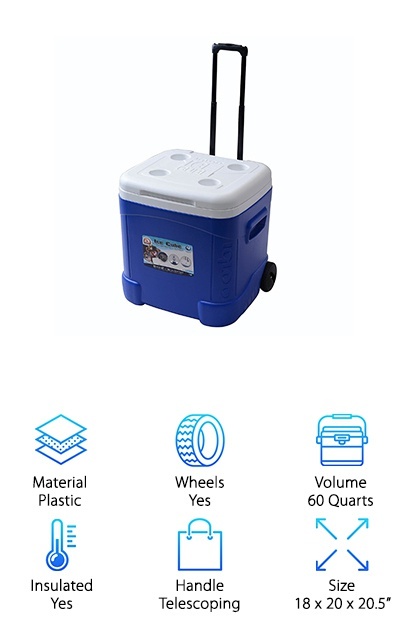 The best beach cooler with wheels also has multiple handles. We loved both the telescoping handle in the back for rolling, and the side handles for controlled carrying. The Coleman does come with two large, secure wheels on the back side. Tilt back with the telescoping handle, and roll away – you won't have to lift a thing, even over sand! 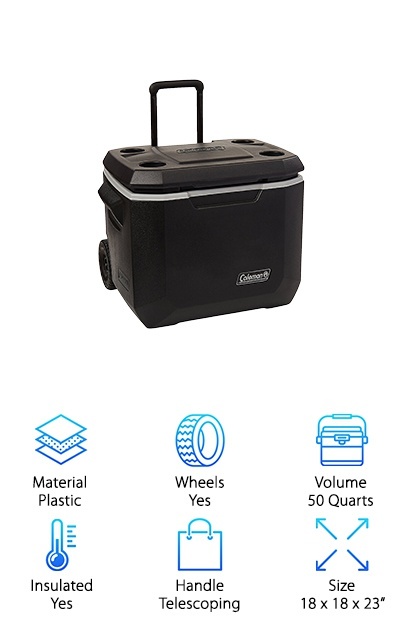 The cooler can keep ice frozen for days, so it's great for camping trips. And you get a 1-year warranty on your purchase. Yogi Bear would not have had to steal from as many picnic baskets if he had kept the MIER Insulated Picnic Bag around. Keep your food safe from curious bears and hungry strangers with our budget pick. It’s going to be perfect for a picnic lunch for the family, or transportation for a work lunch to the job site. It will fit equally well in the great outdoors, and the company fridge. It holds about 19 quarts, the equivalent of 20 cans of soda, or two large meals. Place your water bottles, entrees, fruit and dessert with room to spare. The outside is fabric, with a sunny Palm Beach-style design. Inside, it is insulated PEVA or polyethylene vinyl acetate, so your hot food will remain hot and your cold food will be chilled and protected. There are both handheld straps and a shoulder strap for getting this beautiful bag around town or up into the woods for some fun. Do you need to save space for an upcoming family vacation? Do you find yourself with both arms full on trips to the beach, exhausting yourself before you ever reach the sand? It's time to check out the CleverMade SnapBasket Cooler. The polyester exterior is made with rip-stop fabric. It will last a long time, and it is virtually waterproof. Inside, thick vinyl insulates and preserves the temperature of the items you’re carrying. It gets better! The inside is also leak-proof, so you won’t leave a mess wherever you go. This reusable cooler is also collapsible for storage, but it is well-structured so that it doesn’t flop inward unless you need it to. There is a front zippered pocket where you can separate your valuables, and there is an included bottle opener! This cooler will hold a total of over 30 quarts of food or drinks, which equals out to about 50 cans of soda plus ice. Wow! The best cooler for carrying ice around looks a little like an ice cube itself. The Igloo Ice Cube Roller Cooler is the party accessory you’ve been looking for. Holding a whopping 60 quarts inside, you can load up several bags of ice and move them without breaking a sweat. Thanks to the sturdy wheels and the telescoping handle with a push button, this is super simple to manipulate. Use it on the sand or rough hiking trails without a problem. When it comes time to unload, molded side handles to get things frosty. The cooler measures 18 by 20 by 20.5 inches, and it is plastic with an Ultratherm insulated body to keep ice frozen for a long time. It's also incredibly handy for cleaning: The inside just wipes down. There is a drain plug that pops out to empty the cooler and get it ready for its next use. Bottom line: This is a fantastic value! Stay stylish with the Aruba Beach Tote Bag Picnic Cooler. 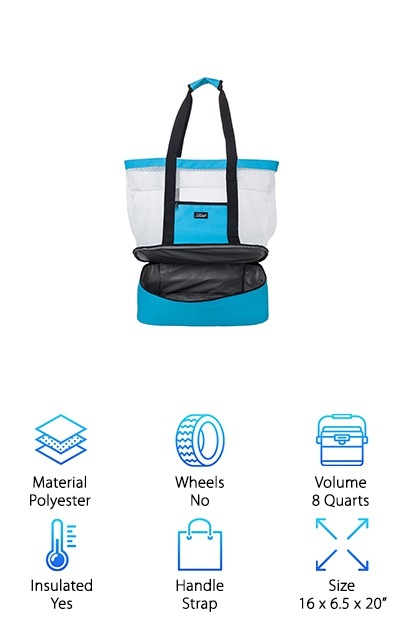 This tote really is two or three bags in one. Here’s what you get: A beautiful canvas and mesh bag, all in fashionable black. The mesh section is generously sized, so parents can place sand toys or wet bathing suits without worrying about the mess. There are also front and back Velcro compartments to place valuables. At the bottom is an optional cooler section. It is insulated and will keep 4 water bottles nice and cool as you get a tan or play a game of beach volleyball. The shoulder strap is 9 inches long and is comfortable to use. The handles are padded and reinforced as well. Barbecues or sporting events will be so much easier with one or two of these in tow. Finally, use the top zipper to get all of your stuff secured. You’ll love the 12-month warranty that comes with the Aruba Beach Tote! It's clear to see that Coleman is one of our absolute favorites when it comes to durable, long-lasting beach coolers. You'll get it, too, after we tell you about the Coleman 42-Can Wheeled Soft Cooler. Baseball and football games will never be the same after you try this cooler on for size. Made with a strong plastic frame, mesh and fabric lining and an insulated cooler interior, it's fashionable and handy. As indicated by its name, it can hold about 42 cans of soda or 28 quarts of food and drinks. There is a telescoping handle for easy pulling. Just lean the cooler back to pull using the two wheels in the back. When it stands upright, the cooler rests on two front plastic "feet." There are also reinforced side handles for controlled carrying. If you're worried your items won't fit inside, there are optional side and front pockets. The lid also bungees to make more room! Are you searching the internet for both hard and soft coolers, but you don’t know which one will best suit your needs? What if we told you that you could get two in one? Take a look at the Picnic at Ascot Ultimate Travel Cooler. This is crazy: It comes with a lifetime warranty! 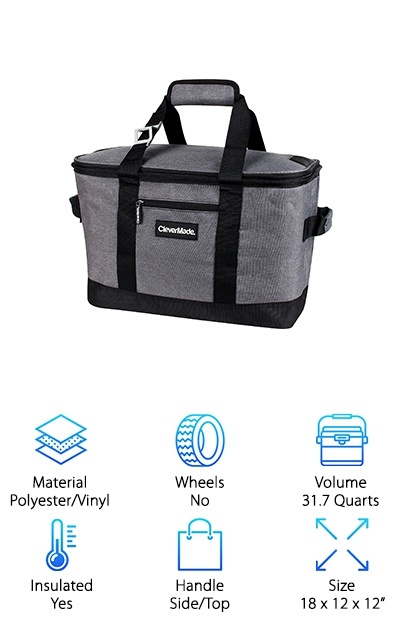 This is a fabulous find, beginning with the fact that it is indeed for a hard and a soft cooler, built with a steel rim and flexible side supports. It will fold flat for traveling, so you can even stick it inside a suitcase. Once it is opened, it fits 36 quarts of food or drinks inside the insulated interior. The high-density foam will keep ice frozen for 24 hours, so a hot day at the beach won't melt things down. On the outside, the tough poly-canvas fabric is designed with green and white accents. Carrying handles are on either side, along with a telescoping handle and wheels. Wouldn't it be nice to head out to a beach day with your snacks and drinks all in tow? Spread out your towel, get out your favorite book and settle onto the same with a crisp, refreshing soda straight from your Lifewit Soft Cooler. It’s the perfect size to become a tagalong friend on any outdoor outing. It’s also perfect for lunches at work. 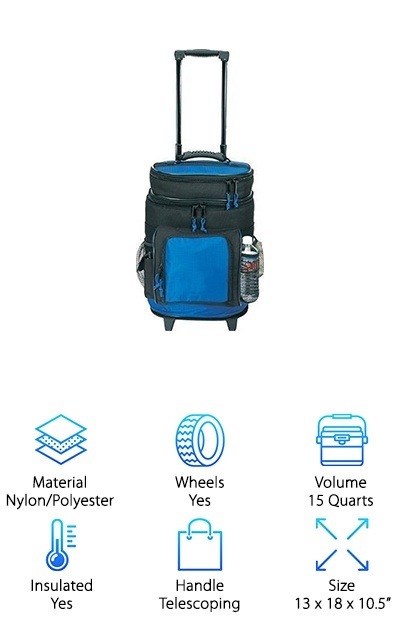 It can hold 50 cans of soda or beer, with more than 30 quarts in capacity. The premium aluminum foil lining is backed by dense foam, so your food and beverages are insulated as you travel. Along with the padded handle, there is also a detachable shoulder strap. 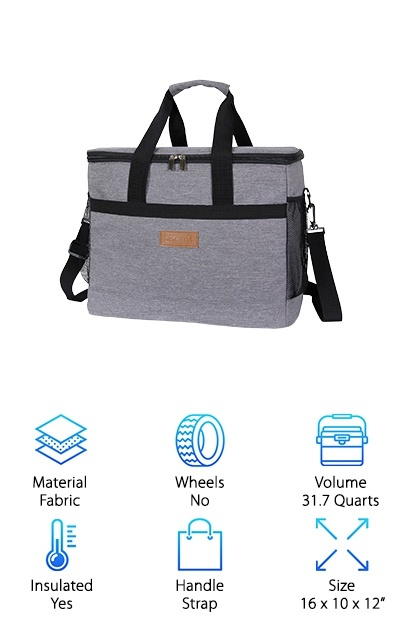 This perfect picnic bag is heather gray and black, and it won’t take up any extra room at 16 by 10 by 12 inches. The exterior is fabric and mesh, with side pockets for items that don’t require refrigeration. You can also fold it flat for storage! An on-the-go lifestyle means you need accessories that can keep up with you, and never slow you down. The Travel5.0 Deluxe Beach Travel Cooler is just the ticket. The outside is high-quality polyester, mesh, and rip-stop nylon. There is both a cell phone pocket and a pocket for a water bottle. Inside, there is a sandwich compartment and a fully insulated cooler. Padded with foam, it comes with a removable liner. To get the Travel5.0 bag moving, use the top padded handle, or the telescoping handle and rubber roller skate wheels. To give you an idea of its roominess, the cooler can accommodate about 24 bottles of water. And with all of these amazing travel features, it can even go with you on a plane. It fits in the overhead compartment! It is stable and won’t tip over, and you can fit an entire lunch, a snack, and the contents of a purse or wallet if necessary. Our reviewers want you to know how special the MALIBU Beach Bag Cooler really is. First are the lifetime warranty and replacement guarantee. The folks at blue sky BASICS want you to know how much they believe in their product! Then there is the incredibly helpful two-in-one design. 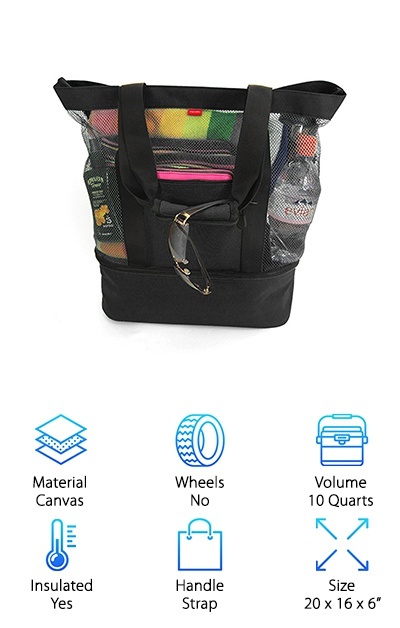 The top half of this beach cooler is a mesh bag, ideal for towels, sunglasses, books and bathing suits. 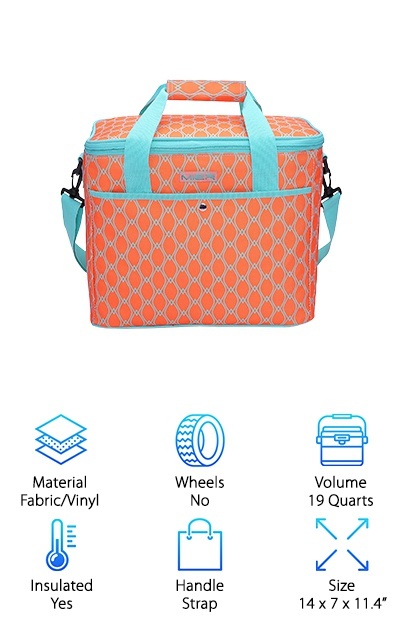 The bottom is an insulated cooler, capable of holding 12 juice boxes, coconut water or beer. You never have to carry around two separate bags again! There are also two outside zipper bags with waterproof lining. Place your phone or your keys, and don’t worry about them getting wet or bogged down with sand. The bag itself is polyester, with a comfy reinforced shoulder strap. The sky-blue design will stick out on any seashore or hiking trip. When you’re done with this bag, put it in the washing machine! It will then fold flat for storage.